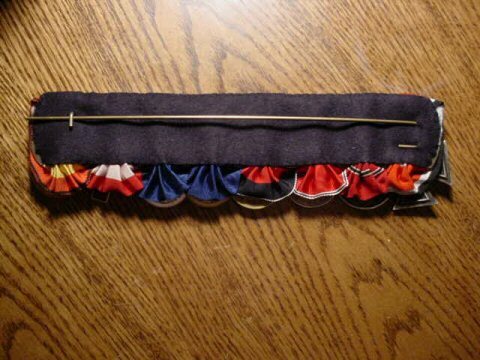 DESCRIPTION: This is a very special 10-ribbon bar with a few rare ribbons and appurtenances. From left to right they are as follows: the WWI Second Class Iron Cross with Spange from WWII indicating the wearer won the IC again in WWII. 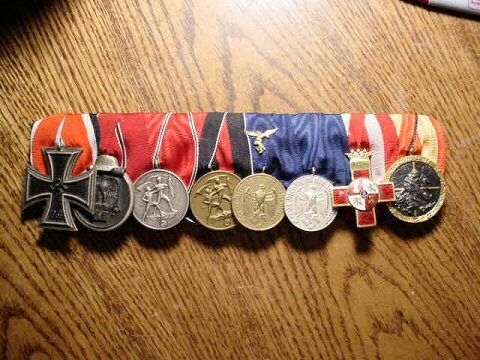 The Iron Cross with crown and swords (special royal recognition); three Hanseatishes orders in a row; the WWI Commemorative Medal, the Luftwaffe Four-year Service Medal, the Hungarian Medal of Merit, and a Turkish medal. 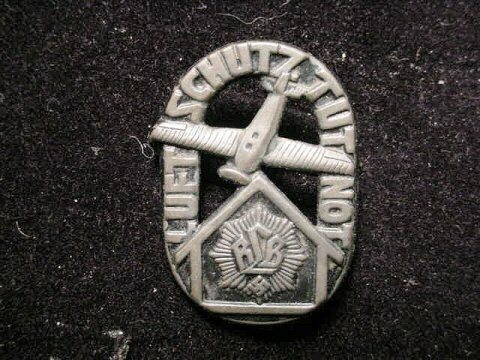 DESCRIPTION: This is a pin that commemorates and designates members of the Reich Luftshutzbund, Air Raid Workers. It says the Luftshutz is ready. 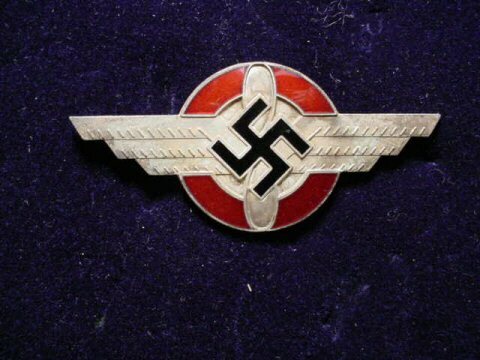 DESCRIPTION: Here is a pretty little pin from the German Glider Corps, NSFK (National Socialist Flying Corps). It has a genuine piece of Bernstein (amber in its center). The holy stone of Germany! with the Fleiger insignia. Aluminum-material bezel. Very nice. Over 1 inch in diameter. 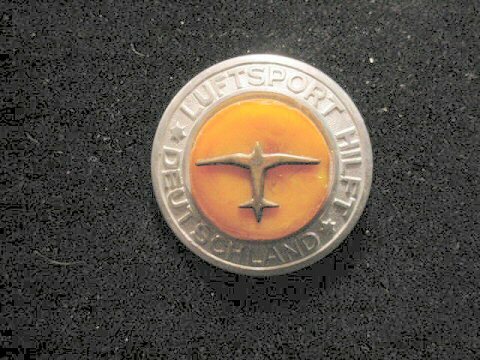 It says: "Luftsport Helps Germany!" 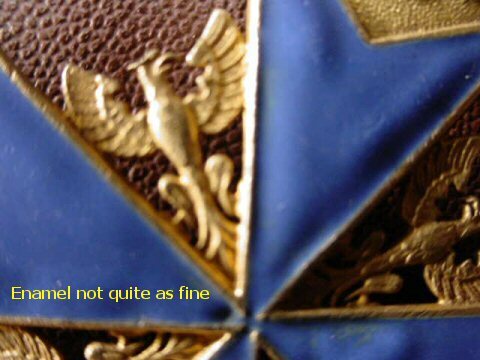 DESCRIPTION: This when normally encountered would be a cap insignia for the nationally-sponsored club for the promotion of air-related sports; however, this specimen is unusual in that it is not a cap insignia and is rigged up for use on a cap. We have never seen one like it. It has the type pin as used on tinnies on the back with "RZM" and "Ges. Gesch." It measures 2 ¾ inches in length and the black and iridescent red are very striking indeed; perhaps a breast insignia or a very expensive tinny for the time. 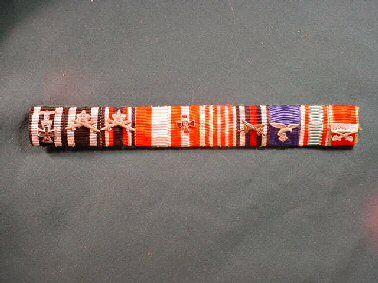 DESCRIPTION: Here is a wonderful medal bar that undoubtedly was owned by a former member of the Legion Condor. It is comprised of the Iron Cross First Class, the Eastern Front Medal, the Commemorative Medal of 13 March 1938, known as the Medal for Entry into Austria. Next is the Commemorative Medal of Oct 1938 know as the Entry into the Sudentenland. 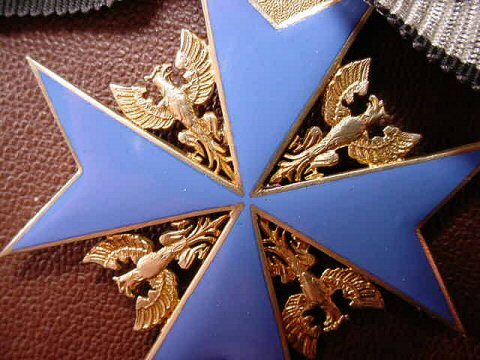 Next is the 12-year Award Medal for Wehrmacht Luftwaffe. Next is the 4-year medal for the same. This man had 16 years showing with these two medals. 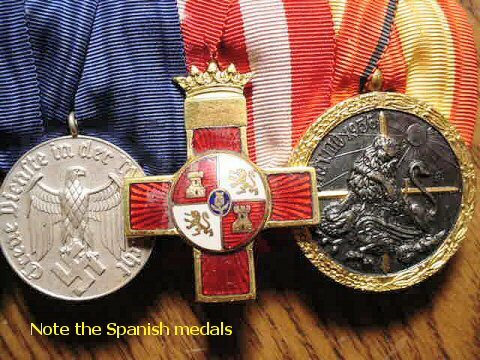 Next is the Spanish Cross of Merit and the Spanish Falange Medal of Heroism given to many of the heroes of the Legion Condor. A large, beautiful medal bar and historically very important. 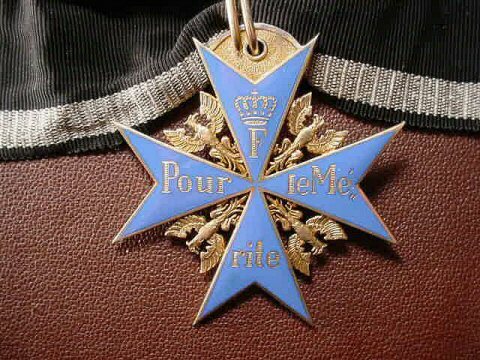 DESCRIPTION: Here is a very fine example of the illustrious Pour le Mérite, the medal that was so coveted by the airmen of WWI and now also hunted and desired so greatly by the collectors of today. 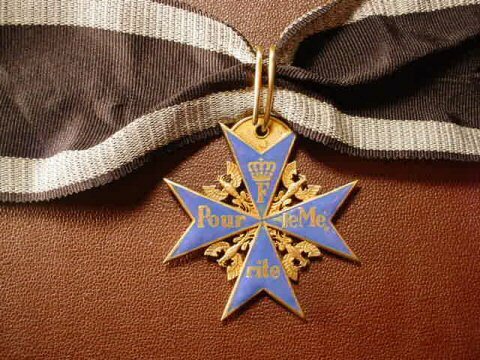 Collectors of WWI and even the Third Reich hobbyists consider this to be a Germanophile prize like no other. This is in the fine corn-flower blue color with the finest definition to the eagles. No, this piece is not hallmarked. So if that’s your particular bailiwick as to originality, then don’t even inquire. 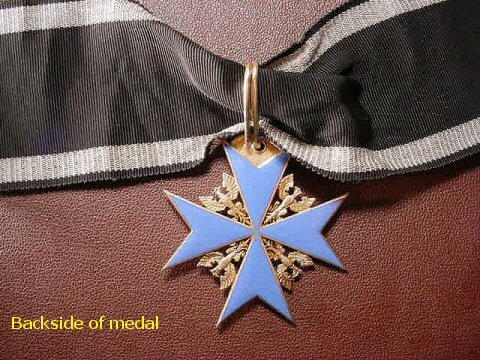 The medal has the fine cutout tail feathers that were the style of Rothe of Vienna and Godet of Berlin. This Rothe examples have the filled semicircle suspension and are not marked in any way. The lighter blue is characteristic of Rothe pieces. 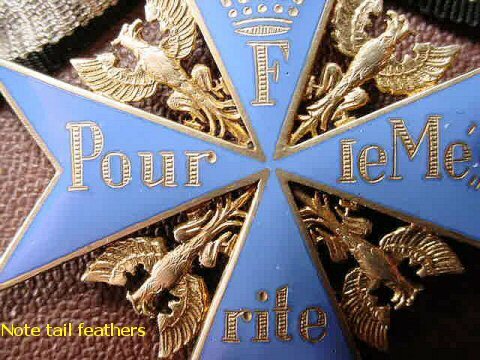 A common characteristic of all the issue WWI badges was the distinctive square formed by the tail feathers of the four eagles. The symmetry of this design is one way to judge the workmanship and authenticity of the badge. 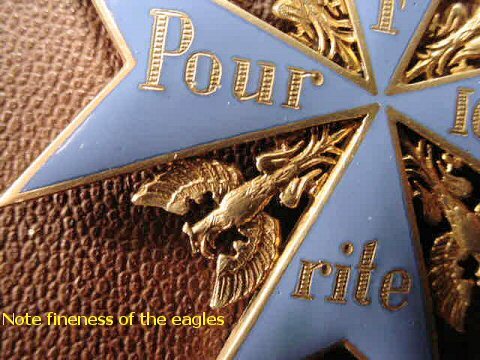 The eagles’ legs are also narrow, delicate pieces extending to small footpads on the arms of the cross. This is a detail invariably neglected in copies or WWII replacements. 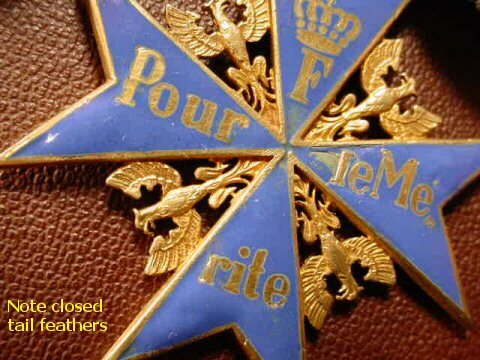 Some of the above information comes from the book The Prussian Orden “Pour le Mérite” by David Edkins, who worked closely with Dr. K.G. Klietmann of Berlin, the world’s foremost authority on medals of the German Empire. This medal meets every requirement of what the experts have deemed necessary for authentication and thus we feel we offer the genuine article here. We will not engage in doing endless measurements or other forensic tests often asked by persons who invariably are not buyers. In any case, we have done our utmost to picture this wonderful medal to perfection and one picture is worth a thousand words, as they say. 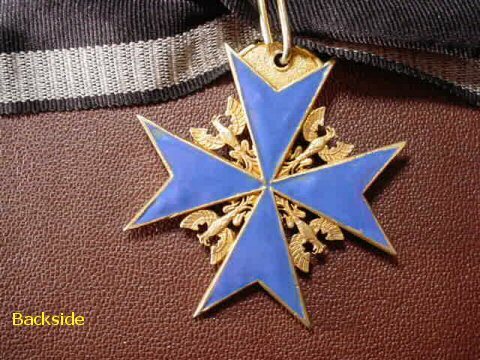 This medal comes from a consigner whom we implicitly trust and respect. We sell it with the usual guarantee in the knowledge that it is 100 percent genuine and just the greatest Germanic relic that can be found. DESCRIPTION: This is a Rothe Blue Max of the type issued to persons who had lost their original issue or surrendered it to allied captivity. Also, it was given to men who had been “field awarded,” but never received it because of German capitulation happening before it could be presented. The quality is good. The eagles are very pronounced and detailed; however, unlike the issue Rothe pieces from the war, the tail feathers are not finished and the square formed by the tails does not readily appear like on the early pieces. The suspension is solid and filled in as the earlier ones. The blue enamel is deeper in color and the crown does not have the jewelling as in the earlier models. The enameling is not near so fine, but without comparison with the issue piece of the “Great War” it is usually not discerned. 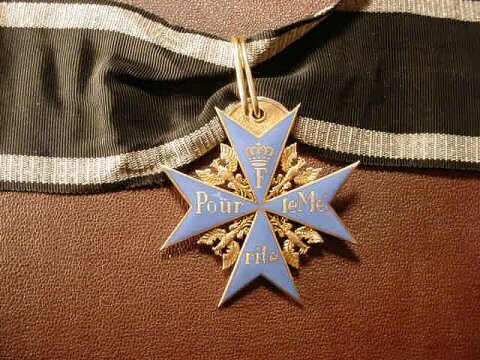 Although not nearly as nice as the Imperial issue, overall the medal still has historic value in that they were nonetheless awarded to heroes of the war and are deserving of recognition as a historically important relic of that time of Blut und Ehre.